Pocket Colouring Book TOPModel. Thinking about your next building and you can not always have your notebook handy? Now with the Topmodel pocket book will not be a problem. Car, bus, subway, taxi or on foot, are the methods of transportation you can use daily, whether accompanied by someone or by yourself. They take time, and in that short time your mind can be thinking about new models and designs. Now you can take this notebook has a small pocket and you take it in any bag. It is just what you can think of an idea and you can not draw it. 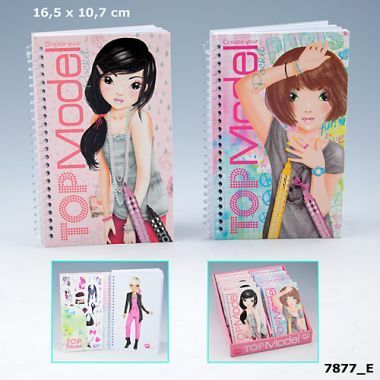 Sticks with accessories and different models make up the sheets with pocket notebook create your Topmodel. Pocket book measures 10 x 16.5 x 1 cm.